Discussion in 'Stock Market Today' started by bigbear0083, Mar 22, 2019. Good Tuesday morning to all. <-- click there to read! Hope everyone has a great trading day ahead today. 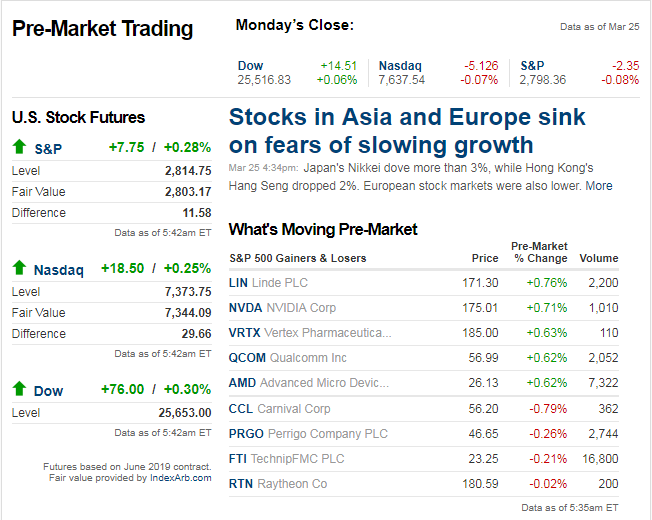 Equity investors around the world are breathing a global sigh of relief this morning as most equity markets have at least partially rebounded from Friday and Monday’s weakness. There’s a healthy dose of economic data coming up 8:30 with Housing Starts and Building Permits and then Consumer Confidence at 10 AM. Keep an eye on semis today as yesterday, they underperformed the broader market by a pretty wide margin, and then last night Samsung issued a profit warning. Semis have been the market’s leadership group for some time now, so bulls don’t want to see that group falter. Things are looking up a bit today, but the last five trading days have been hell for bank stocks. After the KBW Bank Index briefly peaked above its 200-DMA last week for the first time since late September, it has been nothing but declines for the group ever since. During the last five trading days, the KBW Bank Index has seen daily declines of 1.32%, 3.02%, 1.53%, 3.92%, and 0.42%. In total, those declines work out to a five-day decline of just under 10% (9.83%) compared to a drop of just 1.22% for the S&P 500. 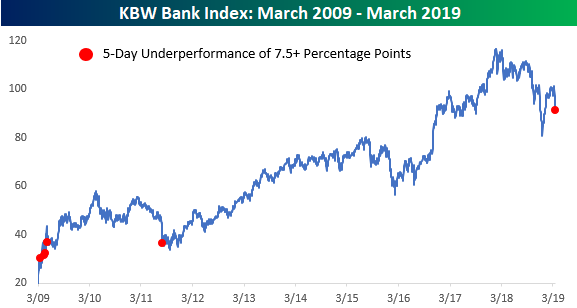 With bank stocks underperforming by more than 8 percentage points during this stretch, it goes down as the worst relative performance for the group since August 2011. Since the lows of the Financial Crisis, there have only been five other five day periods that saw similar underperformance, and all but the 2011 period occurred during the very early stages of the rally. You don’t see relative underperformance like this in the bank stocks very often. XRT up another ~1% today. But GOOS has been weak. Make up your mind already! That’s the way traders are feeling towards the market these days. Whether you are a bull or bear, it’s hard not to be frustrated with how the equity market trades lately with its complete lack of decisiveness. 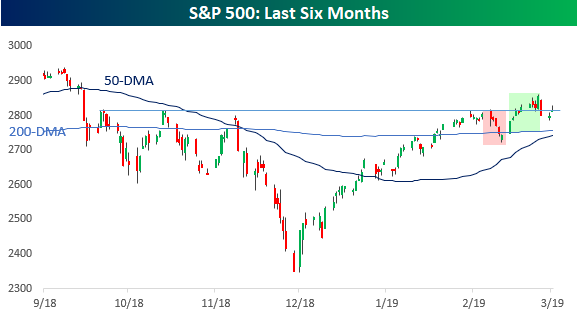 After repeated attempts at breaking through 2,800 in the fourth quarter, the S&P 500 attempted to break through that level once again in late February but stalled right at resistance. Then, in the first full week of March, it seemed as though another roll-over was in store as the S&P 500 saw five straight days of declines taking the index back below its 200-DMA (light red shaded box in chart). 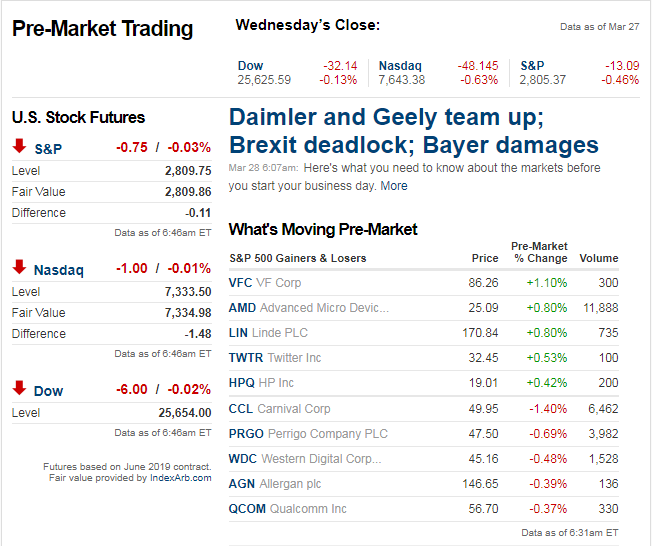 Negative sentiment peaked on Friday, March 8th when the much weaker than expected Non-Farm Payrolls report set the stage for a negative open to close out the week. The weak open on 3/8 proved to be the low point of that sell-off, and in the following week the S&P 500 regained all of its prior losses and traded right back up to the former resistance line. At the close the following Friday (3/15), the S&P 500 even marginally eclipsed that resistance line (provided you had a magnifying glass to see it). The strength from that week followed right through to the next week as the S&P 500 looked to have finally and convincingly broken through that pesky resistance level of 2,816 (green shaded box), confirming that the ‘breakdown’ from the first week of March was a fakeout. Or was it the rally that was the fakeout? Ever since last Wednesday’s FOMC meeting where the central bank took on a surprisingly dovish tone, equities have once again had trouble. Whether it was last Friday’s sell-off that took the S&P 500 back below the former resistance line or Tuesday’s rally which has now seen its early gains more than halved, it seems as though the market can’t make up its mind one way or the other as the S&P 500 sits right on the resistance line at 2,816 as we type! In the span of less than a month, we have seen two moves (one up and one down) that technicals suggested was the start of a move, and both proved to be false alarms. Unfortunately, we aren’t getting much in the way of direction from market internals either. 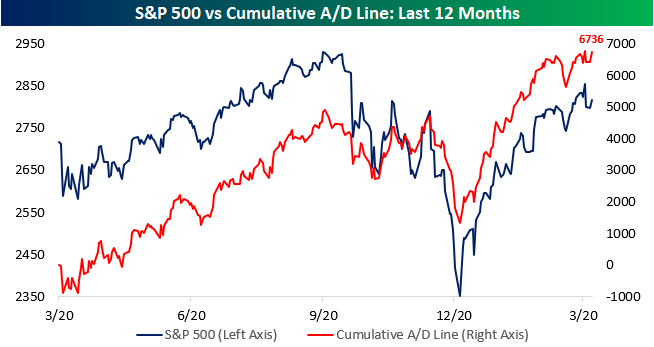 The S&P 500’s cumulative A/D line remains strong, but after hitting new highs earlier today, as equities have sold off, so too has the A/D line putting it back below last week’s highs. The fact that the S&P 500 A/D line continues to hold up right near its record highs is definitely more positive than negative, but we’d much more prefer something a little bit more decisive. stock1234 and OldFart like this. 6J not really moving up, so this "yield curve" excuse for dropping the markets is really smelling fishy ATM. Guessing we stay between 2790-2860 until end of week, and end of quarter. awesome to see @OldFart checking in! Good Thursday morning to all. 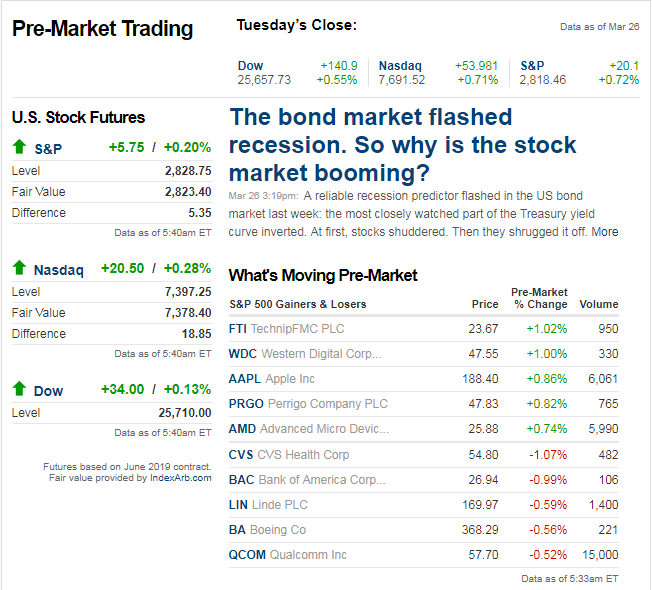 After four trading days of non-stop focus on the yield curve, investors are moving on to the new topic du jour as positive headlines with respect to China have provided a boost to equity futures. As they say, everything old is new again! The news this time around is that the Chinese government is planning to offer more access to its cloud computing market for foreign tech firms. While sentiment is positive right now, there’s a lot to focus on today with a number of economic indicators on the calendar and several FOMC speakers set to speak. Sentiment sure can shift quickly in financial markets, and the latest example comes from Brazil. 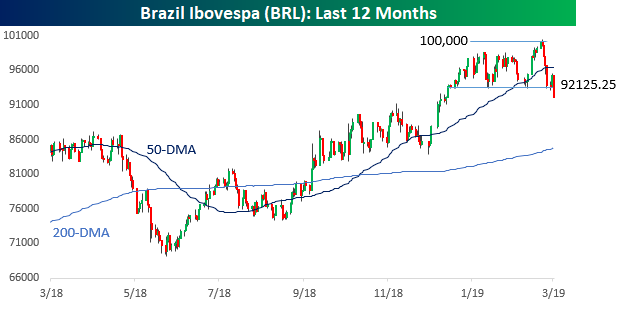 Just a little more than a week ago, Brazil’s benchmark Ibovespa index crossed the 100,000 level on an intraday basis for the first time ever. While the index was still down over 40% in dollar-adjusted terms, crossing 100,000 was a pretty big deal. The party didn’t last long, though. The Ibovespa was never able to close above 100,000 last week, and ever since then, we have seen steady selling. Just yesterday the index broke down through short-term support and is now down nearly 8% from its recent highs. This morning is also looking like more of the same at the open as Brazilian equities are set to open down about 1%. Easy come easy go. Transports up nicely 3rd day in a row. The IYT ETF is running 2x normal volume. SBUX holding up very well this week.